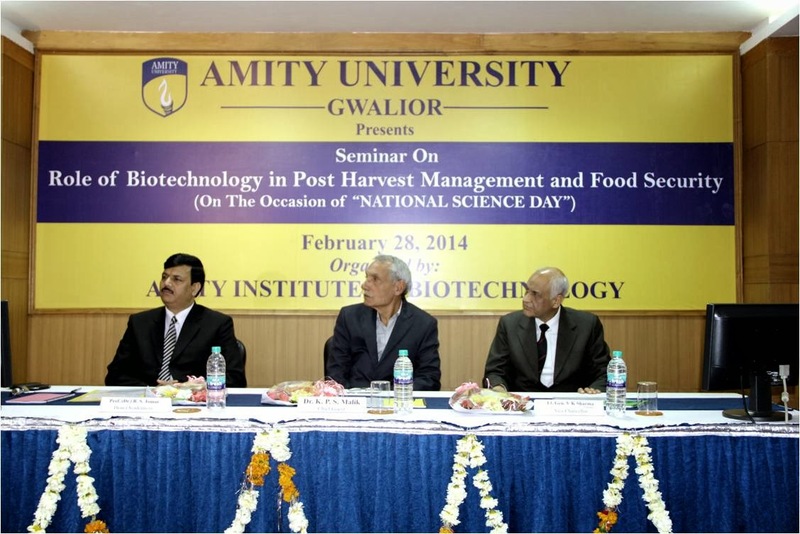 A one day seminar was organized by Amity Institute of Biotechnology on the Role of Biotechnology in Post Harvest Management and Food Security at Amity University Madhya Pradesh Maharajpur, Gwalior to celebrate National Science Day which falls on 28th Feb 2014. The seminar aims to focus on new trends in post harvest management and encourage scholars and students to explore various techniques and studies on post harvest management so as to enhance the quality and quantity of crops and for the safe & secure food availability. The inaugural session of the seminar started with the lighting of the lamp and was presided over by the Hon’ble Vice Chancellor AUMP Lt. Gen VK Sharma, AVSM (Retd.). 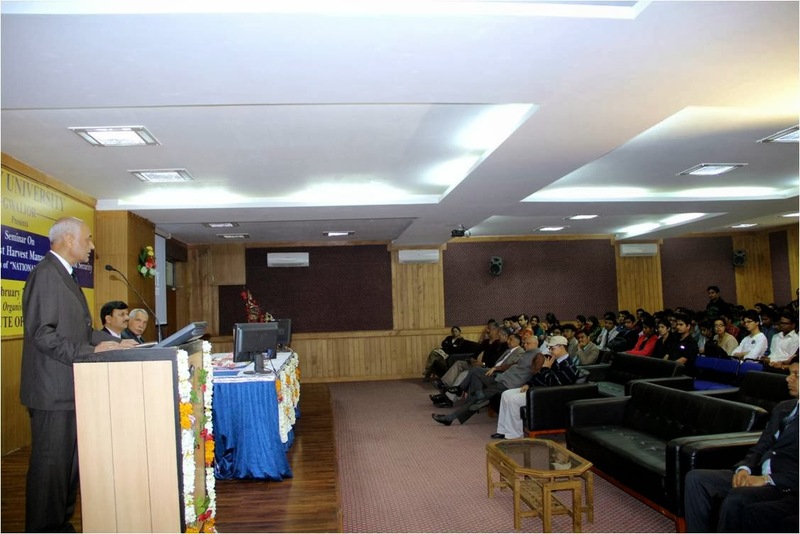 Professor KPS Malik, Former Dean of Rajmata Vijayaraje Scindia Agriculture University, Gwalior was the chief Guest and keynote speaker of the seminar. Gen Sharma in his inaugural address spoke of the great relevance of Biotechnology in everyday life. He stressed upon the need for active research in the agricultural field, crop improvement and post harvest management issues which need to be resolved. 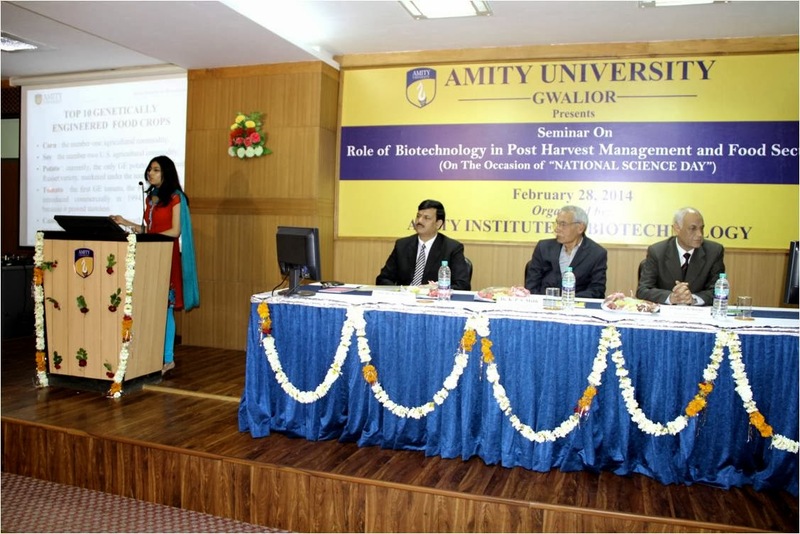 The keynote address by Dr. KPS Malik was focused on exploitation of biotechnology for crop improvement and storage. He explained the success story of green revolution and the present scenario of food security. Dr.Malik also highlighted that in spite of many achievements in the field of Biotechnology, a hue and cry against this technology is being raised, resulting into a indefinite moratorium on testing of these crops. In public view this novel science is being reduced only up to introduction of Bt genes. There were presentations on four sub themes of the seminar. The first group talked on the “Applications of genetic engineering in Post Harvest Management”. The topic was introduced by Ms. Palak Rawat (B. Tech. IV sem) and further proceeded by Mr. Prateek Lahiri (B. Tech. 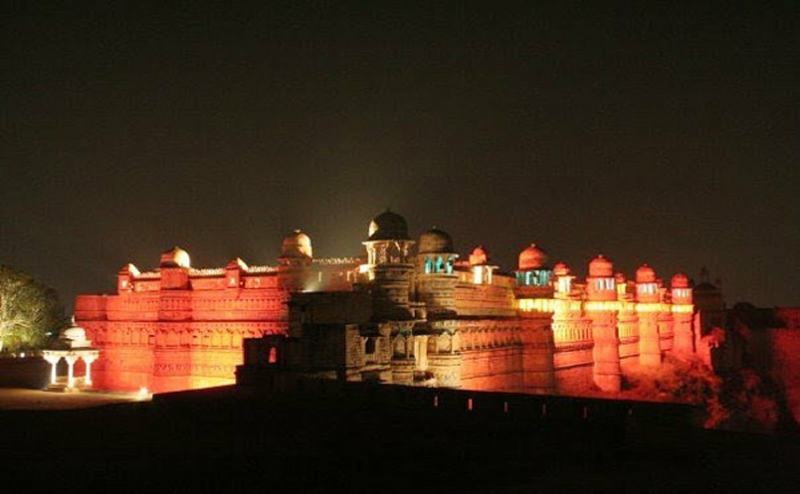 IV sem), Shilpi Trivedi (B. Sc. II sem) and Harshit Agrawal (B. Tech II sem). They discussed about the role of genetic engineering which proves to be an asset to come up with a solution on harvest management of the crops. They reviewed gene silencing technique for increasing the shelf life of crop products by controlling the production of cell wall degrading enzymes. The production of ethylene is also needed to be controlled since it leads to fruit softening by accelerating the ripening process. They took the examples of Flavr Savr tomato and sugarcane varieties to emphasize on the antisense technology in manipulation of gene. The second group gave presentation on the subtheme “Post Harvest Modification and Enhancement of Metabolites”. Pests, old post harvesting techniques and lack of proper management are important factors that contribute towards declining per capita availability of food. So a proper post harvest management including modified techniques and methods to enhance the metabolites are being imposed. The presentation given by Ms. Jyoti Kumari, Mohita Jain (B. Tech IV sem), Ms. Sailee Sanjay Asolkar (B. Tech II sem) and Ms. Pallavi Parashar (B. Sc. II sem) focused on enhancement of metabolites and classification of secondary metabolite groups. A case study on the influence of UV radiations on plant secondary metabolite production was explained along with another case study on the role of phenolics in the resistance mechanism of plants against fungal pathogens and insects. The third presentation was focused on the subtheme “Biotechnological approaches in biotic and abiotic stress management”. The group (Ms. Urvashi Singh, B. Tech IV sem; Ms. Komal Shivnani, B. Tech II sem; Ms. Aditi Pandey, B. Tech IV sem and Ms. Nancy Gupta, B. Sc. II sem) explained the major cause of yield loss in crops. The different forms of stress, biotic and abiotic, are very much responsible for the productivity loss. The case study on Brassica juncea (mustard), highlighted the impact of stress on crop quality and quantity. The small interference RNA technology enhances the stress resistance as given by the success story of bacterial leaf blight. The fourth and the last presentation of the seminar was on the subtheme “Future Challenges of Global Food Security”. With the increasing population, there is a need to secure food. For this, various steps have been taken from prehistoric times. Three revolutions worldwide contribute in this challenge. The presenters (Ms. Ayesha Sajid, B. Tech IV sem; Ms. Ayushi Gupta, B. Tech II sem; Ms. Nitika Gupta, B. Tech IV sem and Mr. Brijmohan Rai, B. Sc II sem) emphasized the role of green revolution and the introduction of genetically modified crops. Israel is the best trendsetter of utilization of techniques in this field. The future challenges and the possible solutions in the food security were discussed by the group. In the Seminar besides senior students of Amity University and Faculty Members, a number of Professionals, Academicians, Researchers and Students also attended the seminar. The seminar concluded with the Valedictory Session. Prof(Dr) Rajesh Tomar, Convener of the seminar and Dean Academics, Amity University Madhya Pradesh made the concluding remarks by highlighting the relevance of Biotechnology in the present context of more demand of food for increasing population because by 2050 no country would be in position to export cereals and other agri producrts. He told the packed hall how Green Biotechnology is the need of the hour and active research should be pursued in this field so that technological intervention not only improves plant yield with high nutritional value but also innovate methods to store agri products safely. This will go a long way in providing quality food for the world’s teeming millions. He proposed the vote of thanks and showed his gratefulness to the Vice Chancellor, Registrar faculty & staff members of AUMP and students from Amity and outside for their patient hearing during the seminar.